Beer, bacon and butter – these are three things that I’m thankful for this Thanksgiving. 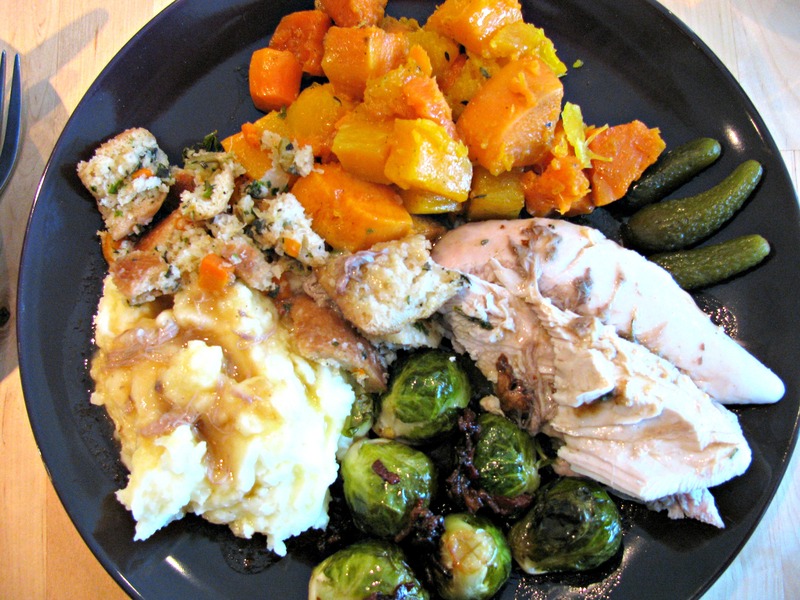 Keep reading below for a full debrief on how Thanksgiving went down in my house, including the salacious details of how the vegetables got drunk (but not wasted). I’m also thankful for the extraordinary autumn weather we’ve had in Toronto this weekend. Each day has been crisp, sunny and nostalgia-inducing, a long weekend tailor made for Thanksgiving. 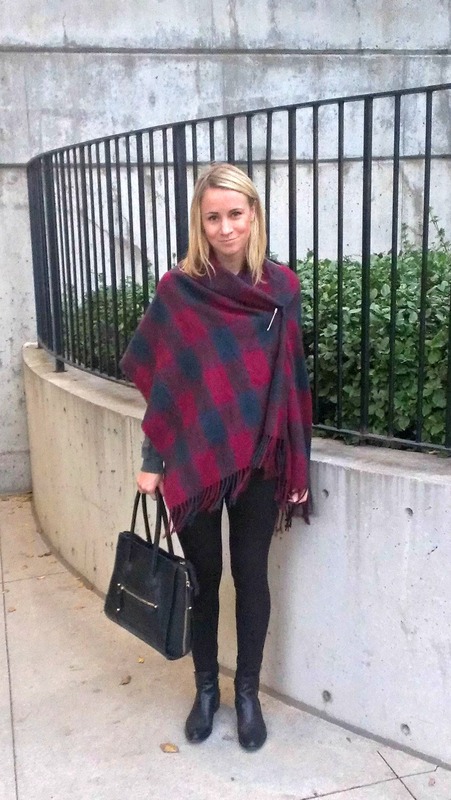 I’ve been traipsing around in leggings, a plaid shawl pinned like a cape and chelsea boots, and will continue to do so until the weather puts a stop to it. 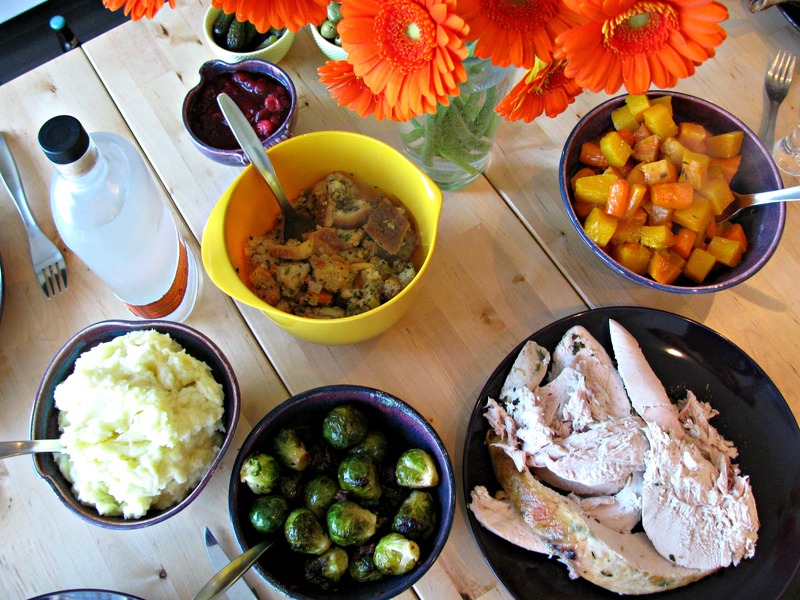 I’m also grateful for family – this was my first year cooking Thanksgiving dinner for my parents who are visiting from out of town. Without my mother, I would not have been able to pull off cooking a turkey, sides, homemade gravy and pumpkin pie in my teeny galley kitchen. Without my father and boyfriend, we wouldn’t have been able to eat it all. This was my second year cooking a turkey – last year we did Friendsgiving and I cooked one from frozen. With memories of last year’s thaw-a-thon still haunting me, I decided to order a fresh turkey from The Healthy Butcher. We also picked up a container of their homemade dressing and cranberry sauce. 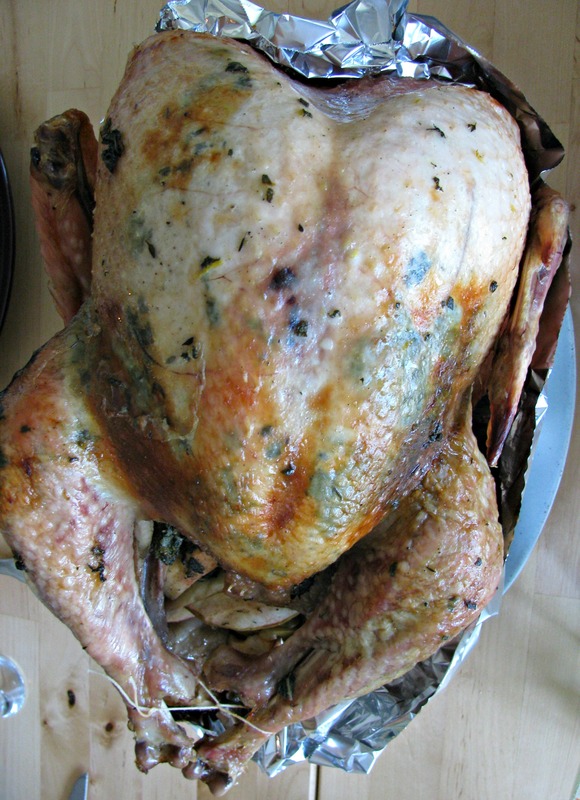 We warmed the dressing separately in the oven, and stuffed the turkey with fresh thyme and sage, a full lemon, a macintosh apple and half an onion so he’d steam up with flavour from the inside-out. 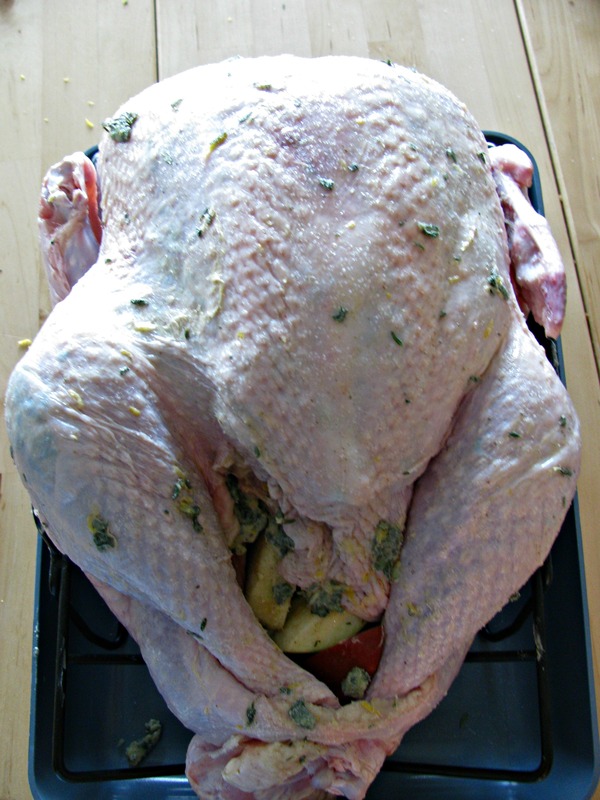 Under his skin we rubbed a mixture of butter, more fresh sage & thyme, lemon zest, salt, pepper, poultry spice and mustard powder. 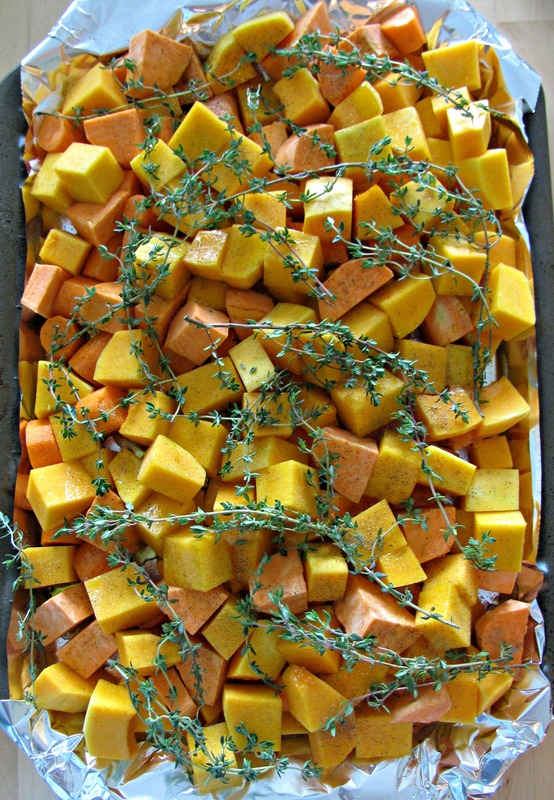 For our main roasted side, we cubed carrots, butternut squash and sweet potatoes. We coated them in olive oil, salt, pepper and thyme, then drenched them in about a cup and a half of Collective Arts Saint of Circumstance Citrus-Infused Blonde Ale so they’d tell all their secrets over dinner. To help them caramelize towards the end we added about half a cup of pure maple syrup. 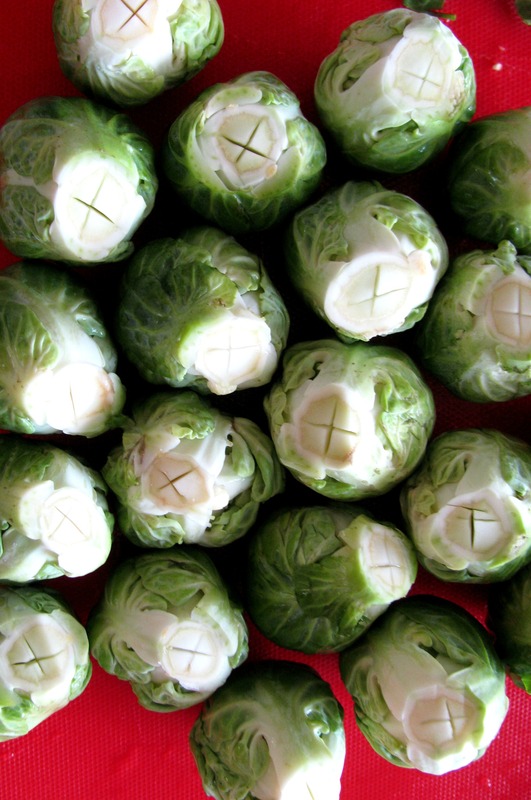 While the root vegetables were roasting, we slow braised brussel sprouts on the stovetop with the same beer, turkey drippings and smoked bacon from The Healthy Butcher. 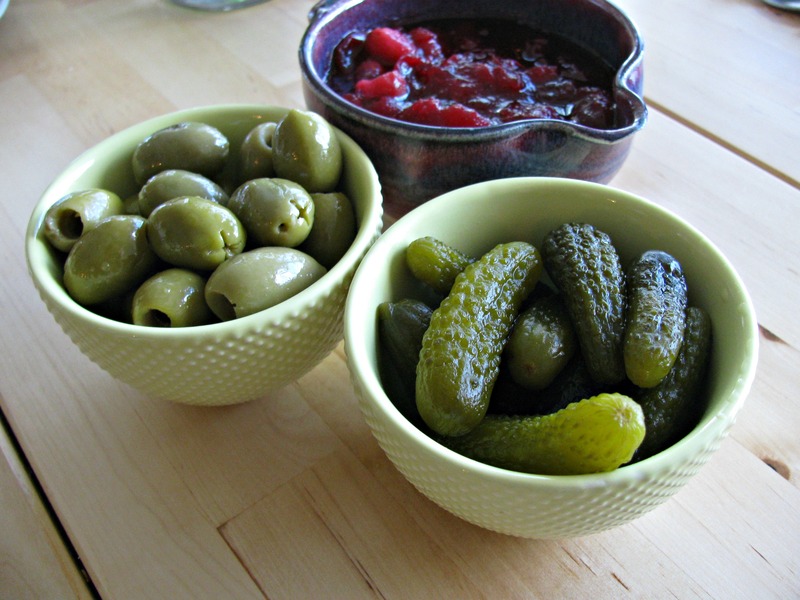 Finger foods were not forgotten – the pickles and olives nested nicely in bowls I got on sale at West Elm this weekend. We whipped up some creamy potatoes in my KitchenAid electric mixer, Betty. Normally I’d add in some sour cream (makes them taste like perogies) but my mom isn’t a fan so we just added a bit of regular cream, butter and chicken stock. We made gravy from the turkey giblets and drippings and dinner was served. 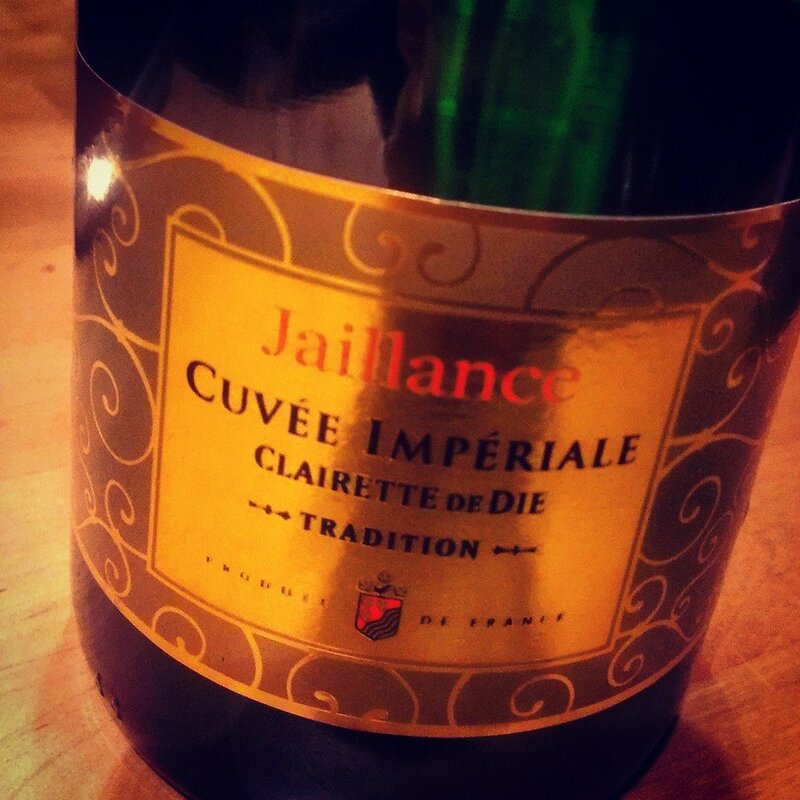 We cracked a bottle of Clairette de Die, a sweet natural sparkling wine from the Drôme region of southeastern France near where I used to live. According to local lore, a Gallic sherpard left a bottle of wine in La Drôme river to chill and forgot it over winter. When it was retrieved in the spring after sitting out all winter, he noticed it had become carbonated. This started a new tradition among Gallic tribes of making sparkling wine. 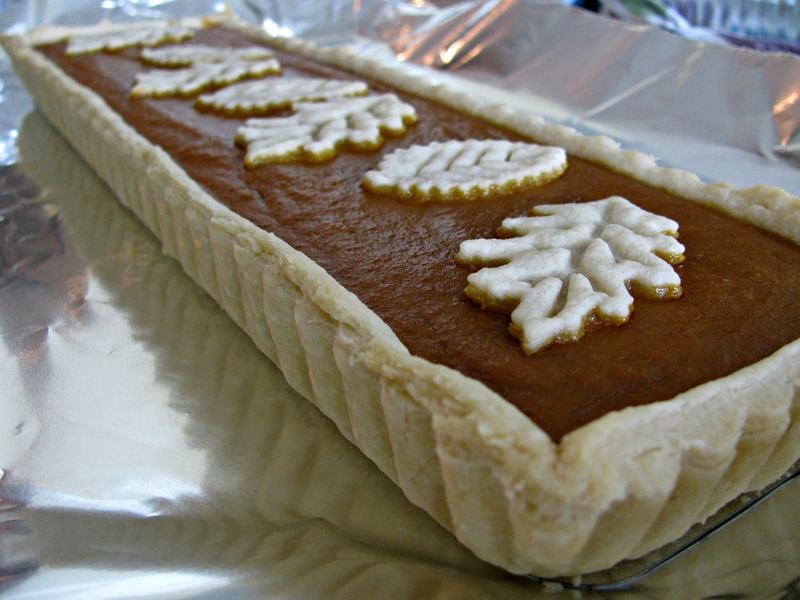 For dessert, I just made a simple pumpkin pie, but used my rectangular tart pan instead of a round pie plate. 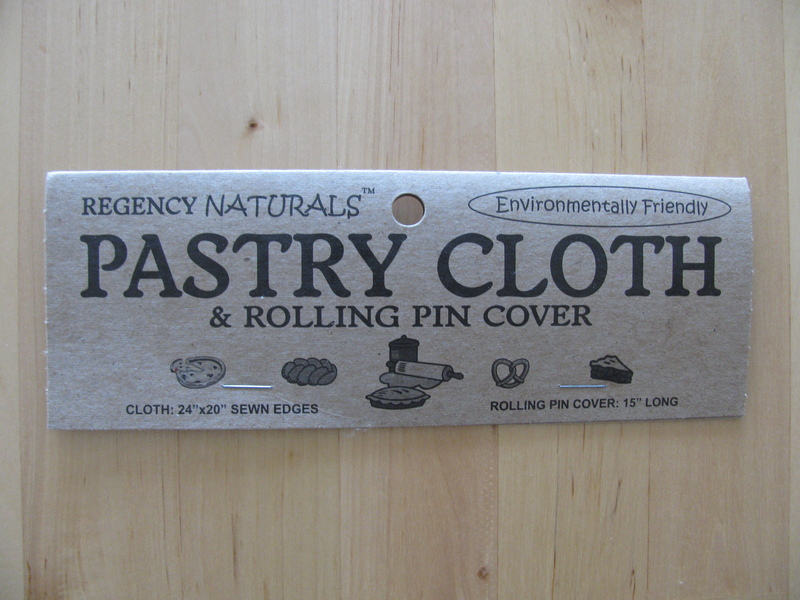 My mom bought me an amazing pastry cloth and rolling pin cover from Lee Valley that has made all of the difference in the world. It was much more easy to roll out the dough and clean up was a breeze. You rub flour into the cloth and it keeps the dough from sticking. 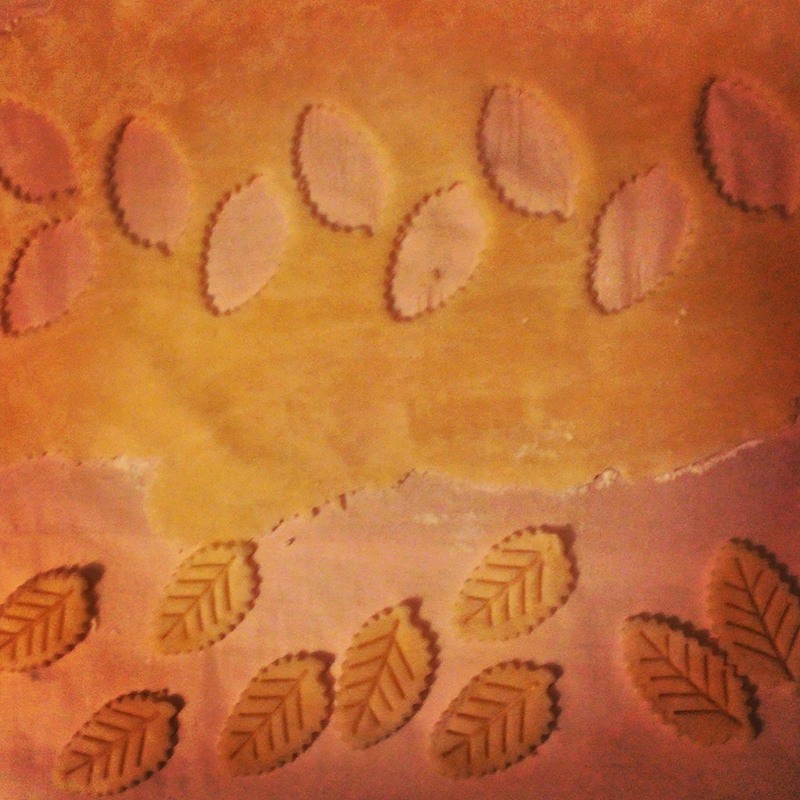 It also imparts a nice cloth texture to the dough which gives it a uniform look. 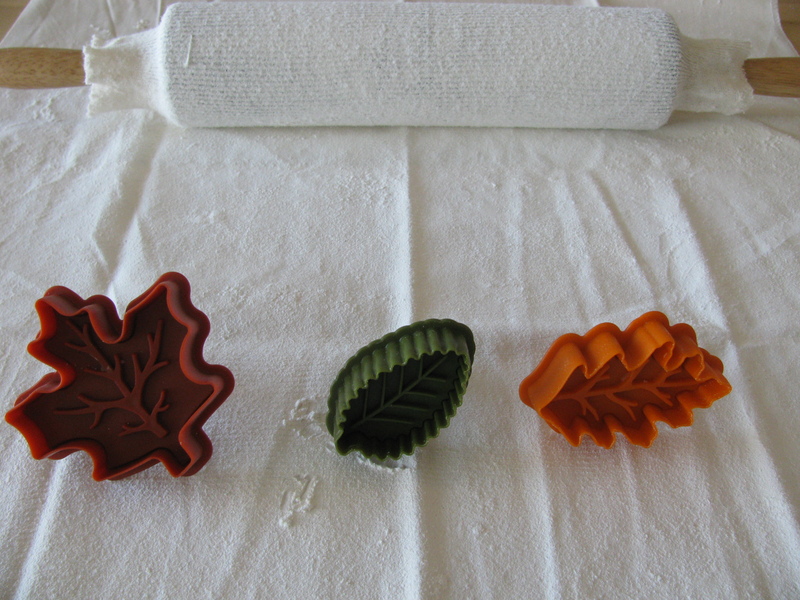 I used my Williams-Sonoma pastry cutters to do a few leaf cutouts as well. 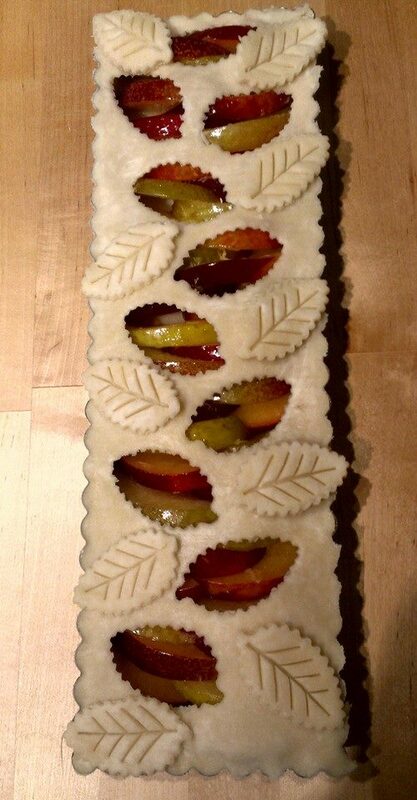 With a rectangular pie, you can slice it into tidy little tranches with a pretty pastry cutout on each one. Fresh homemade whipped cream with cinnamon and vanilla is the finishing touch. And with that picture, I’m off to have some leftover pie for breakfast. Hope everyone has a lovely Thanksgiving! My condo building made the switch from air conditioning to heat this week. For downtown Torontonians, this is our groundhog – the signal that tells us there will be no more weeks of summer. One of my co-workers is getting married in a few weeks and we threw a little party for her at work yesterday. Her wedding has an autumnal theme, so keeping in that trend I made pecan pumpkin pie and chestnut tarts for the celebration. 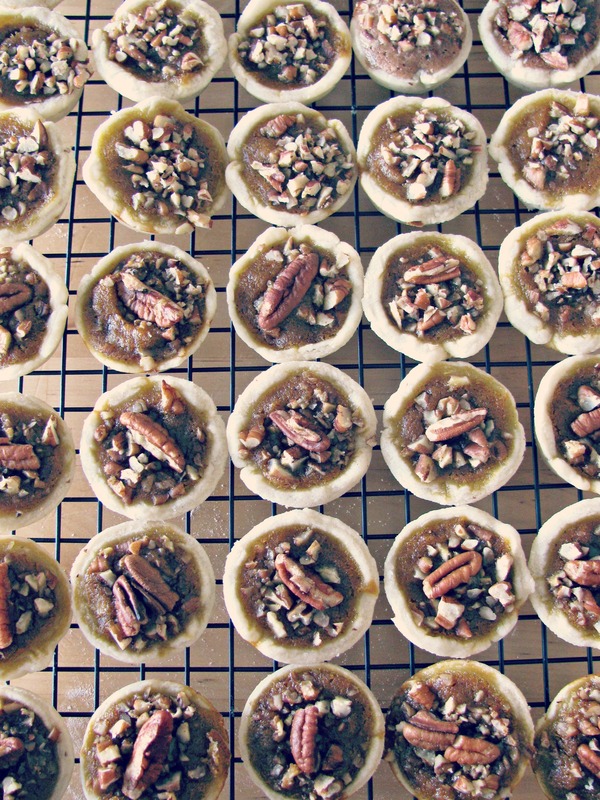 These tarts were inspired by/adapted from Sunny Anderson’s Food Network recipe. I made the ones in the image above using her crust, which is very tasty and quite sweet. 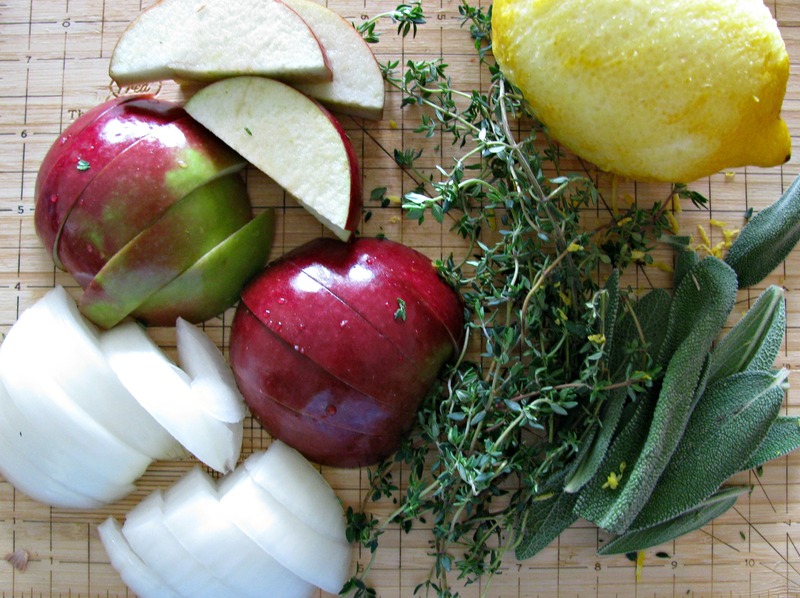 In my version of the recipe below however, I’ve opted for a simpler, more savory crust. I also upped the spice game and made a chestnut version. Variations discussed below and recipe at the bottom! I made a shortening crust using some extra fine Italian flour my boss gave me (she’s a baking nut too). It’s brighter and finer than normal flour but if you don’t have any, normal pastry flour will do just fine. Sunny divides her crust dough into 24 individual balls and presses each of them into the tart cups. I’m not great at eyeballing dough measurements consistently, and my dough’s not meant to be over-handled, so I used a wine glass to cut out little circles. 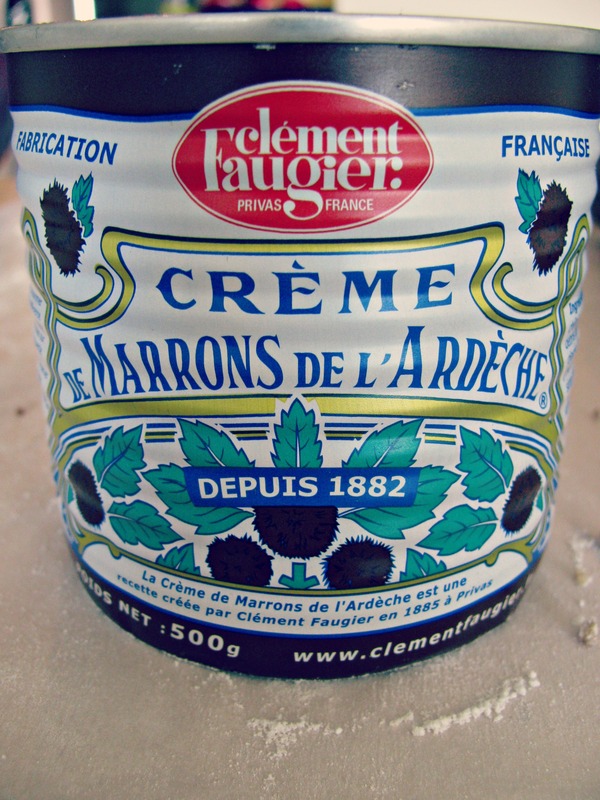 Crème de Marrons, or chestnut spread, is pretty common in France and is used as icing on yule log cakes around the holidays. It’s harder to find here in Canada, but some Whole Foods and a few specialty stores carry it. I knew that with my double batch of shortening crust I wouldn’t have enough pumpkin filling so I thought rather than making extra, I’d try chestnut. The spread’s main ingredient, pureed chestnut, has a texture that’s not too far off from pumpkin. Also, the other ingredients are pretty similar to those in the pie filling above – vanilla, corn syrup and sugar – so I thought it would work nicely. The chestnut spread has a pretty strong flavor on its own (very nutty and spicy), so I just added a few complementary spices and and an egg to make it set. Once baked, the chestnut filling is like a thicker, more flavourful version of butter tart filling. 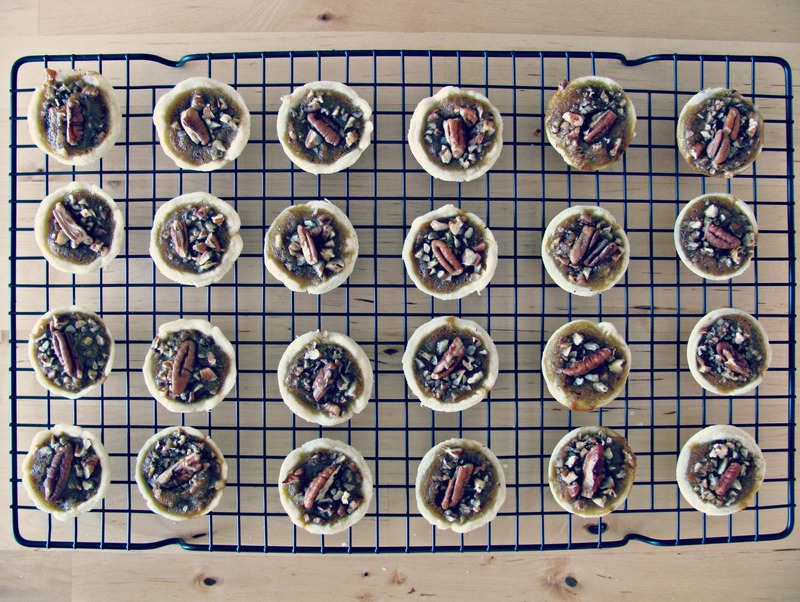 One other variation – I sprinkled the chopped pecans on top of the tarts instead of mixing them in to the filling, so they wouldn’t just sink to the bottom. I made this recipe 3:1 pumpkin to chestnut in case you aren’t sure about the chestnut. I promise you though, it’s even better than the pumpkin! 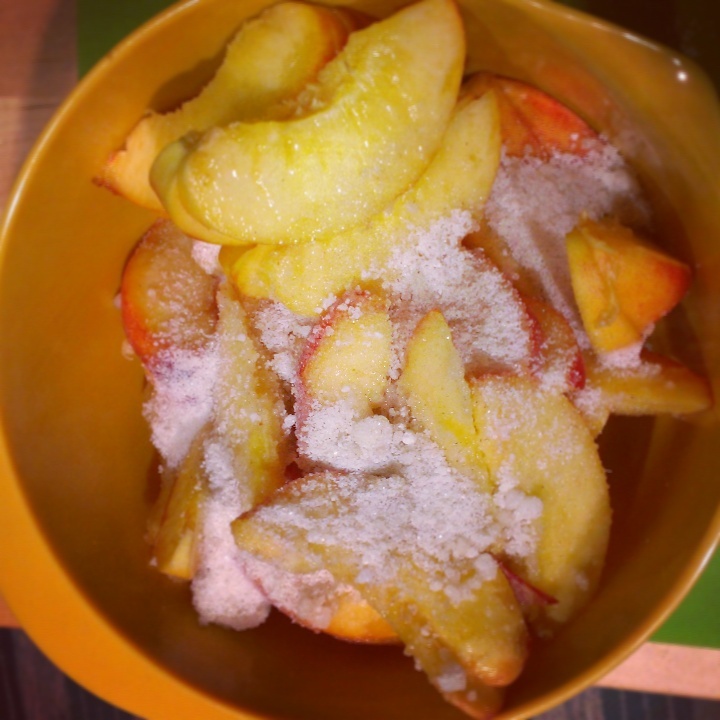 Sift the flour into a chilled mixing bowl and combine with the salt. Cut the shortening into small 1/2 inch cubes and combine into the flour until the mixture is crumbly and coarse. Start adding ice cold water, one tablespoon at a time combining until dough holds together. Handling as little as possible, form into two balls, flatten them into disks, wrap them in plastic and chill them in the fridge for 30 minutes. While the crust dough is chilling, preheat the oven to 350 degrees and prepare the fillings. Prepare pumpkin filling – In a small bowl, whisk the egg and yolk until frothy and then blend in all of the other pumpkin filling ingredients. Set aside. Prepare the chestnut filling – In a separate bowl, whisk the egg until frothy and then blend in all of the other chestnut filling ingredients. Set aside. Chop the pecans and set them aside. Remove dough from fridge and roll out on a piece of parchment paper. 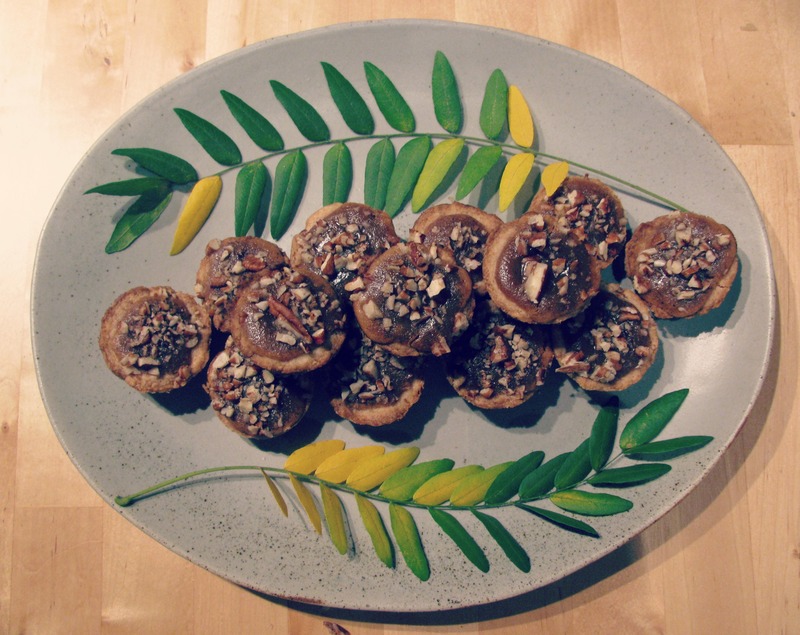 Use a wine glass to cut out circles and press them into the cups of a 24 cup mini muffin pan. 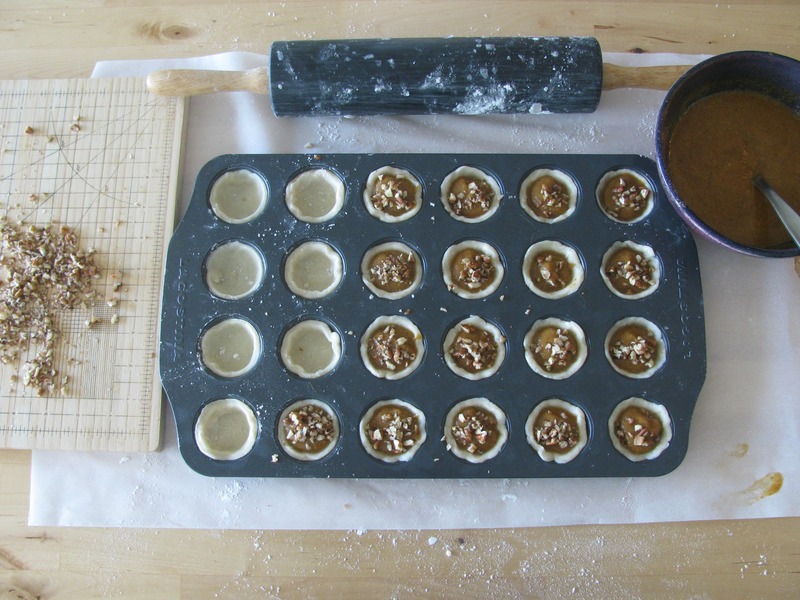 Spoon filling into the pastry cups and sprinkle pecans on top. 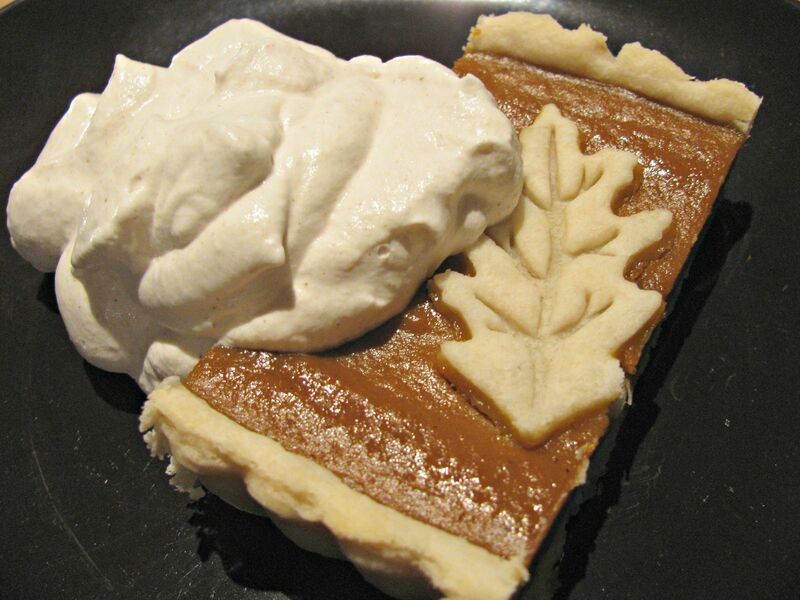 You should have enough crust and filling to make about 36 pumpkin tarts and 12 chestnut tarts. Bake for about 15 minutes or until filling sets. Remove tarts from pan once cool enough to handle and cool on racks. Repeat steps 9 – 11 with second disk of dough and the rest of the filling! Next weekend is Thanksgiving and I’ve ordered a fresh turkey from The Healthy Butcher. This will be my second year cooking a turkey and I’ll have my mom around to help, so stay tuned for pictures! If you follow me on Twitter, you’ll know I’ve been really looking forward to Etsy’s Made in Canada Day. 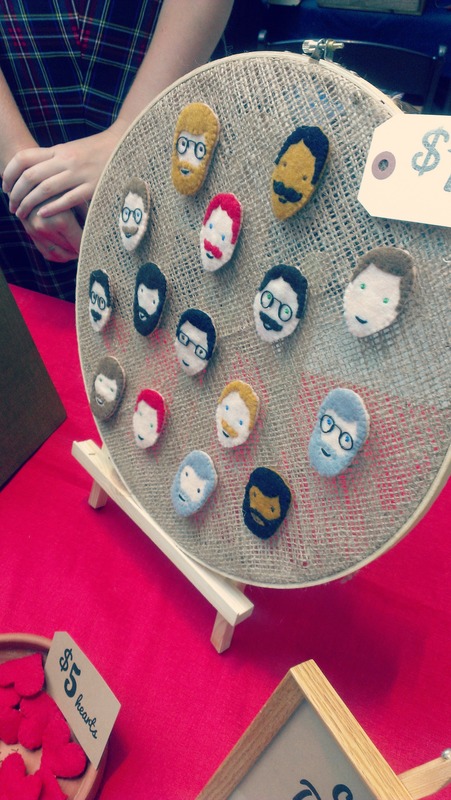 Across the country this morning, Etsy vendors left the comfort of their computer chairs to showcase their wares in person at pop up markets. 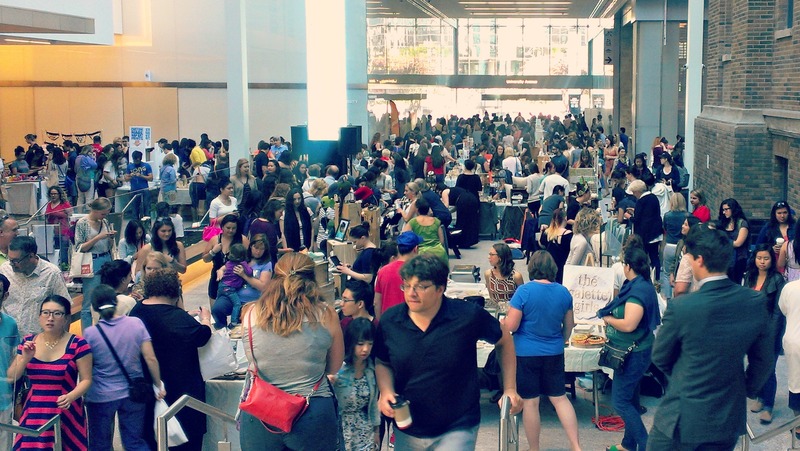 The Toronto stalls were housed in the bricks and mortar of the MaRS Discovery District and did not disappoint. 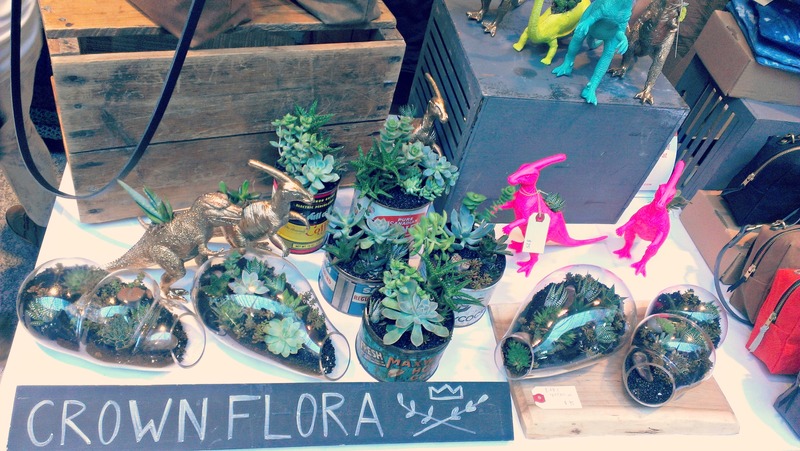 Amid a chorus of ‘oohs’ and ‘awws’, hundreds of Torontonians swooned over felted fauna, boyfriend brooches, cross-stitched cuss words and parasaurolophus planters. The first 50 people to show up got Etsy swag bags filled with items from the vendors. My friend Nikki and I got in line 40 minutes before doors opened, and were probably initially within the first 50 people. Unfortunately, line jumpers pushed us back so we were about five people away from the last swag bag handed out. 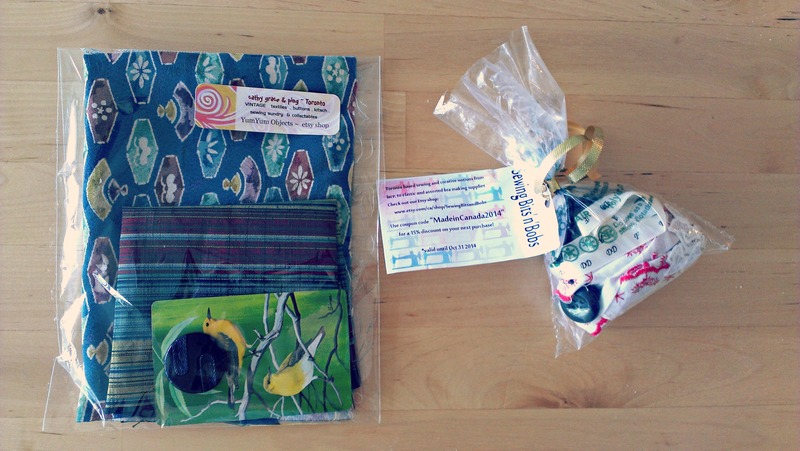 We still got goodies though, including vintage kimono silk samples & buttons, and other sewing odds & ends. 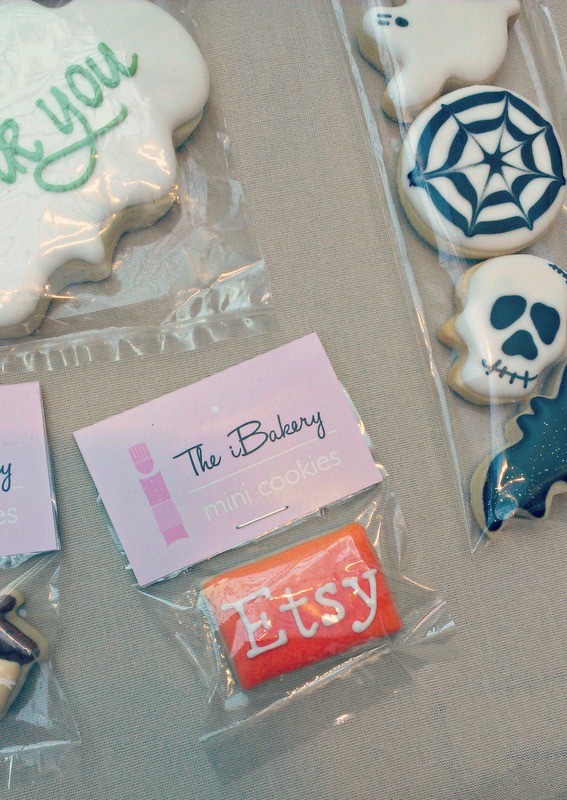 Custom cookies have stolen that place in Torontonians’ hearts once reserved for macarons and cupcakes. This was confirmed when they got their own BlogTO top ten list. iBakery is on the list and on Etsy, so owner Jacqueline Long was at the market today to show off her perfectly precise piping skills. She told us that the actual decorating goes pretty quickly (she obviously has a deft hand), but it’s the drying that is most time-intensive as each layer needs to set before the next can be added. 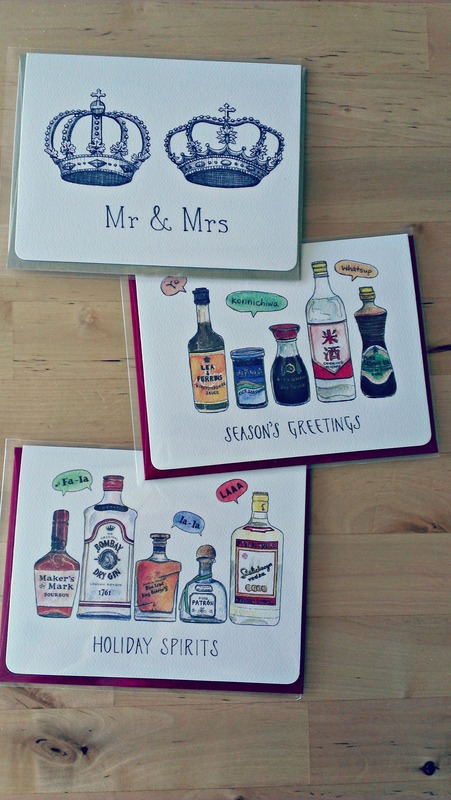 I’ll be ordering bespoke baking for my office holiday party, so watch this space! After hearing a lot of tinder horror stories lately, I can’t help but feel like Hannah Brown is offering the single ladies of Toronto a better option with her Brooch Boyfriends. 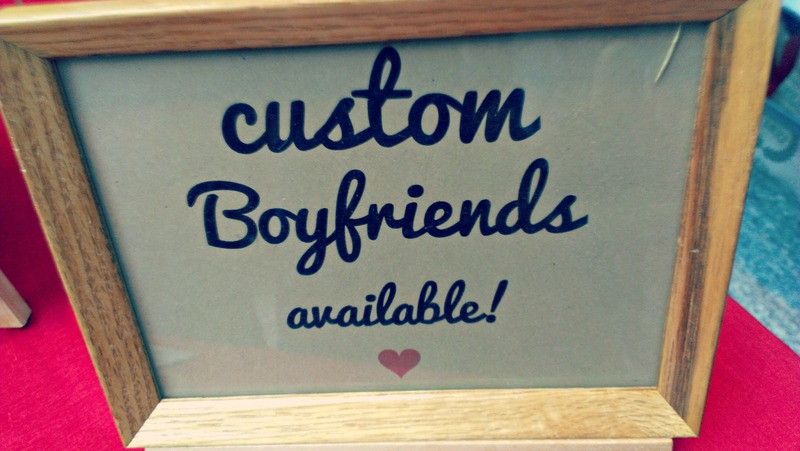 You can request your own customized companion or go the celebrity route – she does felted versions of everyone from Conan O’Brien to the Fresh Prince. I wanted to get one but figured Kevin might get a bit jealous. Also, I’m holding out for her to do one of Benedict Cumberbatch or George Stroumboulopoulos. I have a reputation at the office for having somewhat of a black thumb, which is really quite unfortunate as my mother is the most amazing gardener. She always tells me that succulents are very forgiving, so I was tempted by Crown Flora’s charming terrariums and planters. What better than a green brontosaurus with a crassulaceae spine to show my colleagues that my desk is capable of supporting plant life? Earrings across the hall seduced me away though, and since Crown Flora has a shop on Queen West I figured I could pick up a dino at a later date. I came with a limited amount of cash because I know how addictive Etsy is online, and I figured it would be even enticing in person (spoiler – I was right). Many of the sellers actually took credit cards on their smartphones, but I was able to control myself. 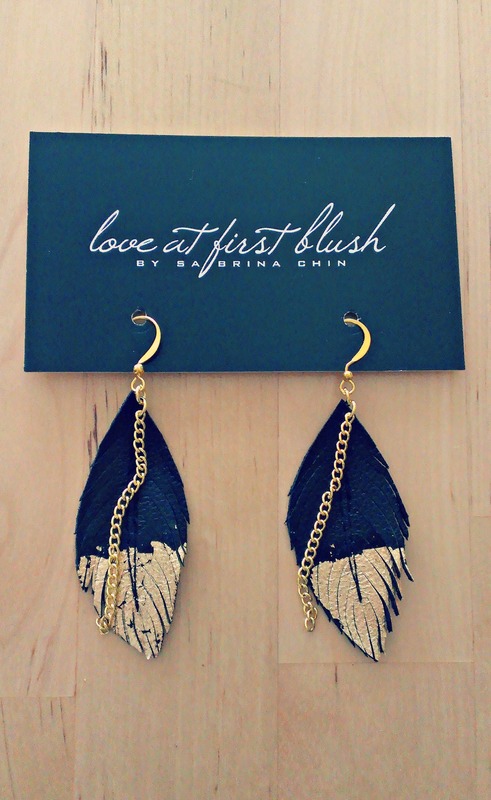 I did buy a pair of leather gold dipped earrings from Love at First Blush and a few ink and water colour greeting cards from Gotamago. After a busy morning of shopping we needed to refuel, so we nipped over to the nearby Reds Midtown Tavern for some brunch. This place is busy during the week with the work crowds, but quiet on weekends as it’s outside of the normal brunch neighborhoods. The patio was way too hot (it was 25 today!) but we sat right by the open windows with the fresh air coming in. 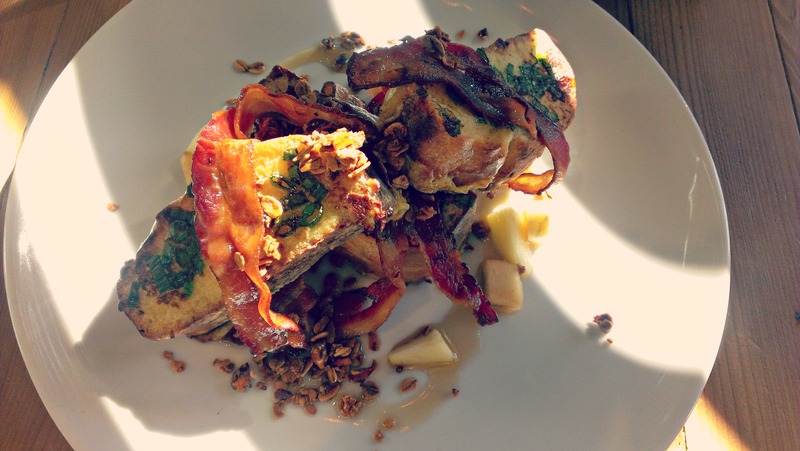 I had the Hunter’s French Toast with applewood smoked bacon which was delicious. They’ve also jumped on the brunch tapas bandwagon, and you can order a bunch of sharing plates with things like apple fritters, donut holes, mini sausage roles, etc. Perfect for those who can’t commit to savory or sweet for breakfast! P.s. 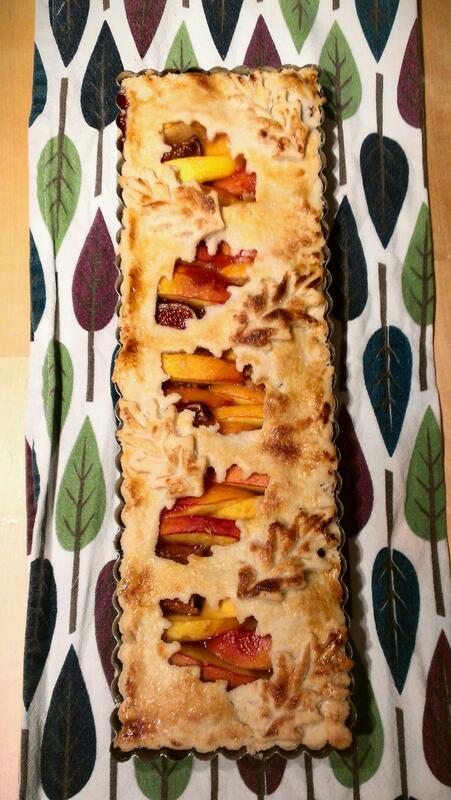 : I’ve been working on some autumn recipes and outfits, so tune in next week for the regular Frock & Fig programming! 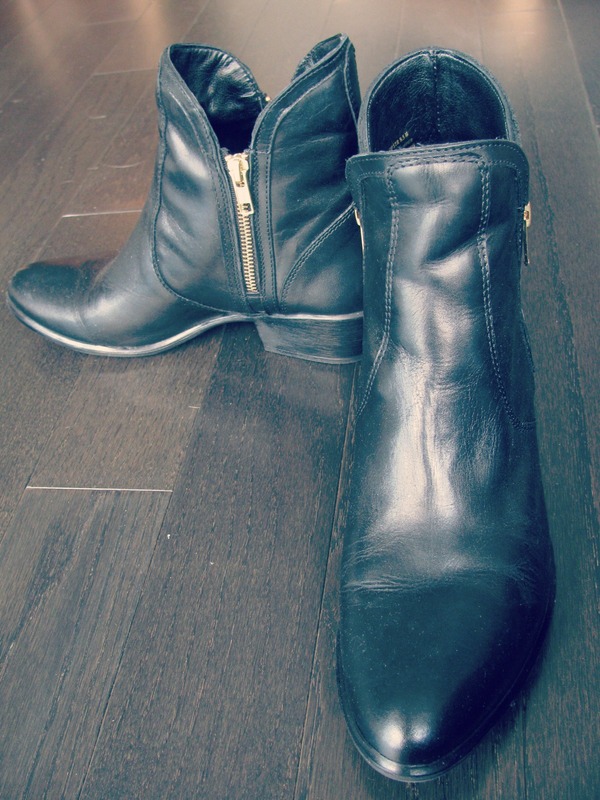 I was going to put a little monologue here about yellow shoes after labour day. But then I realized, I don’t care, these little lemon slice slingbacks are gorgeous. Also, it was TIFF. So let’s just move on, shall we? The Toronto International Film Festival takes over the city once a year and everyone goes a bit mad. People spend their days trying to spot celebrities and their nights watching poignant films that put it all into perspective. Restaurant chalkboards go from “FREE wifi, cold BEER” to “Bill Murray Day Tacos, $3.50” (because of the obvious correlation between Bill Murray and cheap tacos). You see a lot of orange dresses. This year, for a TIFF reception my work was sponsoring, I went to the complementary end of the spectrum and wore blue. I attend receptions for work regularly and this sort of look is my standard uniform. I have a lot of frocks that follow this formula – very tailored, conservative length, modern neckline, flattering colour. 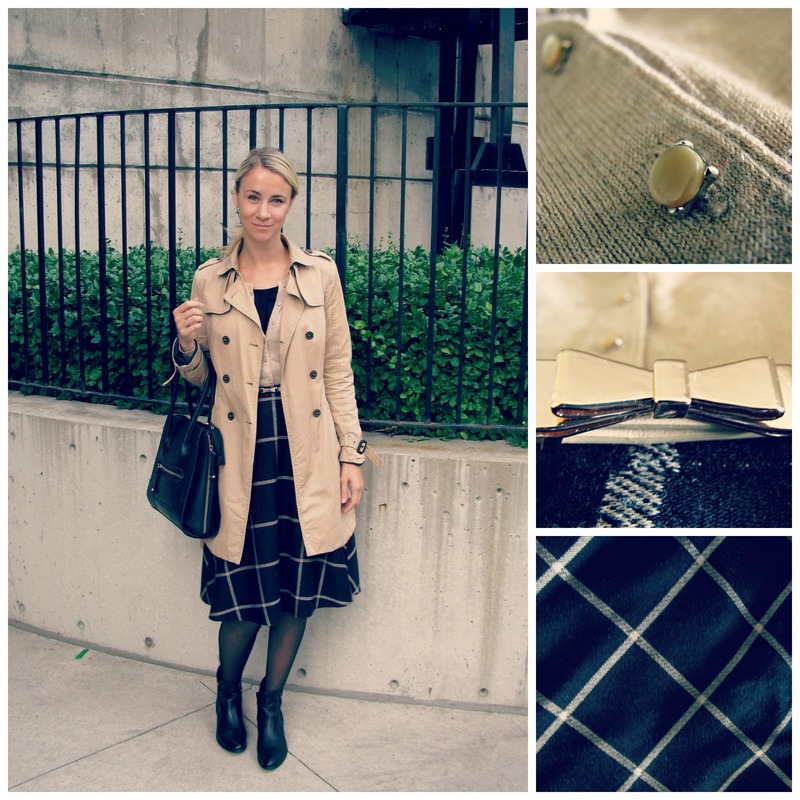 My cocktail hour mantra is WWCUW – What Would Claire Underwood Wear? (Or Rachel Zane. Or Kate Middl- OK, I’ll stop). 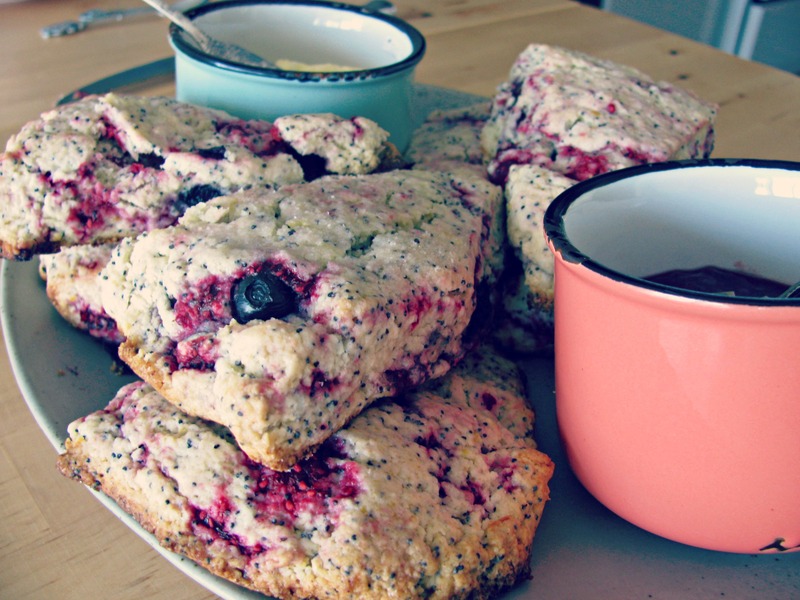 I’m a sucker for scones and love to make them on Saturday mornings. Usually I like to bake fussy, dainty pasties but when it comes to scones I think the best ones are knobbly, crumbly and rustic with poppyseed pockmarks and raspberry veins. Preheat oven to 375°F. 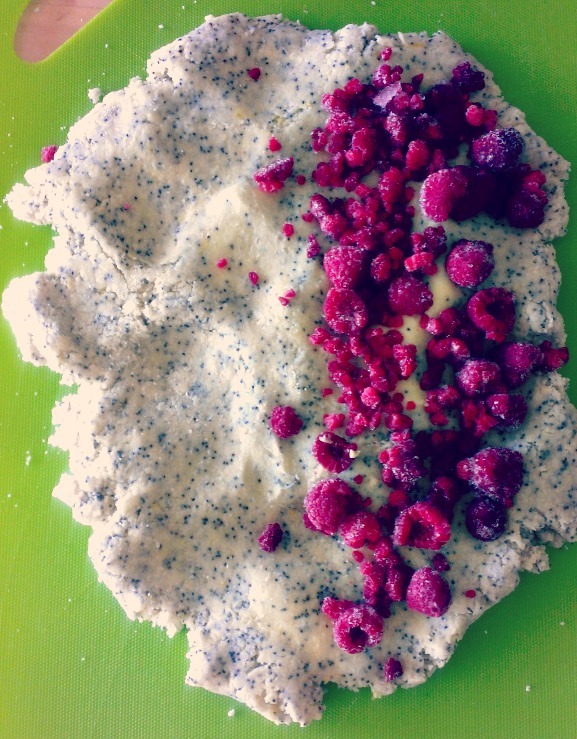 Soak the poppyseeds in the cream or buttermilk in a small bowl while you’re preparing the other ingredients. 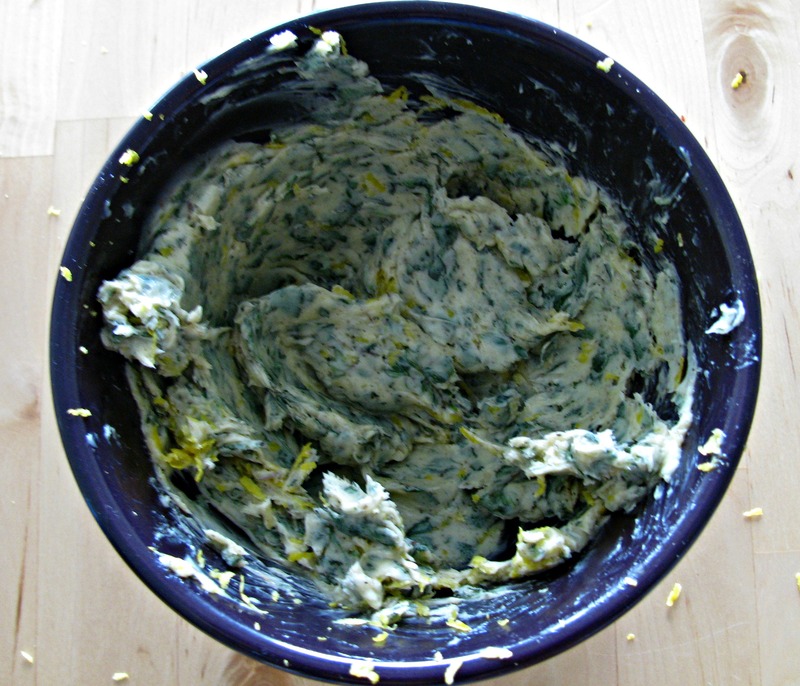 Using an electric mixer, combine the pastry flour, sugar, baking powder, lemon zest and salt. Cut butter into small pieces and blend into flour mixture until mixture is coarse. Add lemon juice and egg, mixing until just combined. 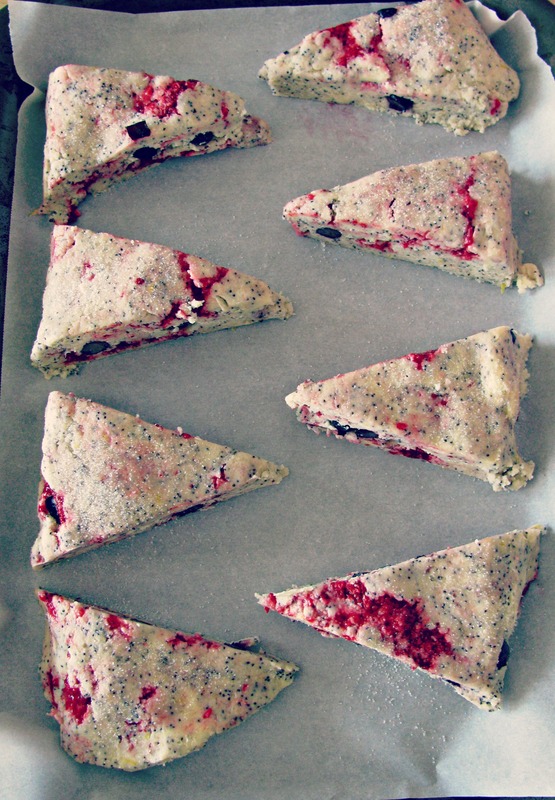 Mix in cream/poppyseed mixture until the dough clumps together – don’t overmix! 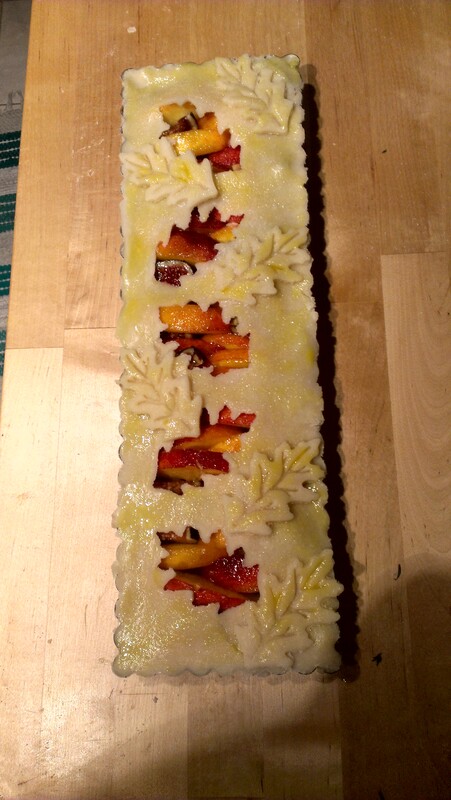 Press dough into something vaguely resembling a rectangle per the image below. 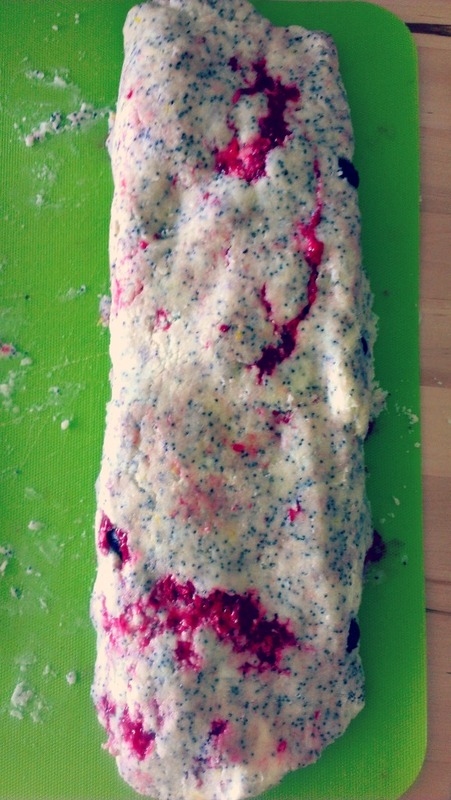 Add frozen raspberries to one half and fold over. Roll out again as best you can and do the same thing with the frozen blueberries. This time when you fold over, try to shape it into a more respectable rectangle, but don’t worry about it looking pretty. I mean, seriously, look at mine below – the picture isn’t even in focus. Using diagonal slices, cut into triangles. Position them on a baking sheet lined with parchment paper, brush with cream and sprinkle with sugar. 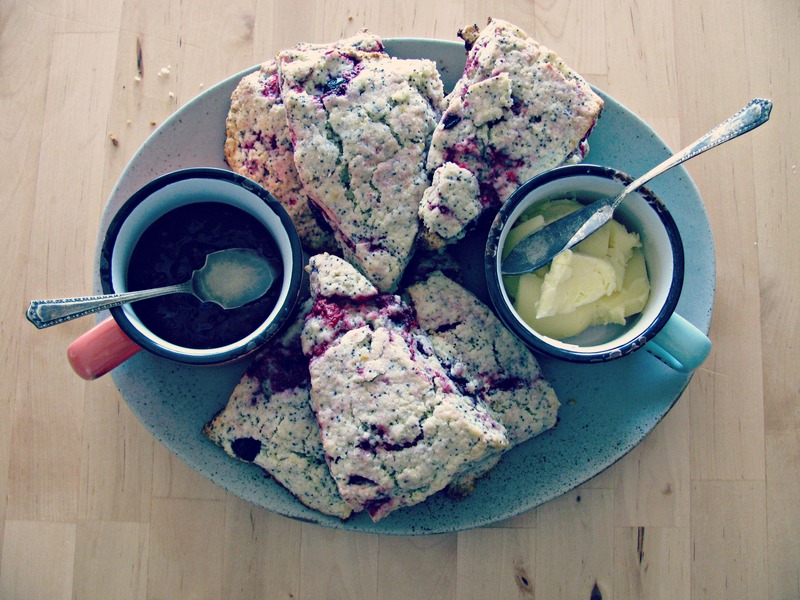 Bake until scones turn golden and a knife inserted comes out clean, about 25-30 minutes. Serve warm with butter and jam, or clotted cream if you’re lucky enough to live somewhere it’s available. 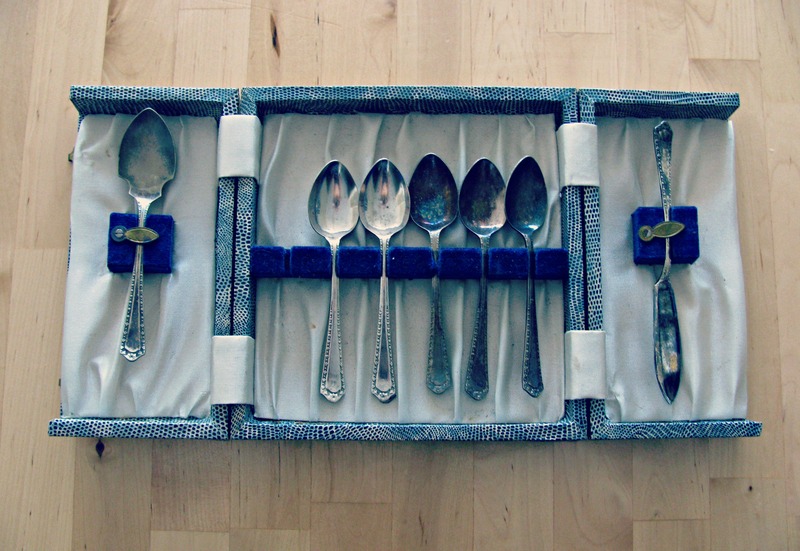 If you have a lovely vintage scone set you inherited from your grandmother, use that. Or you know, whatever you have handy. 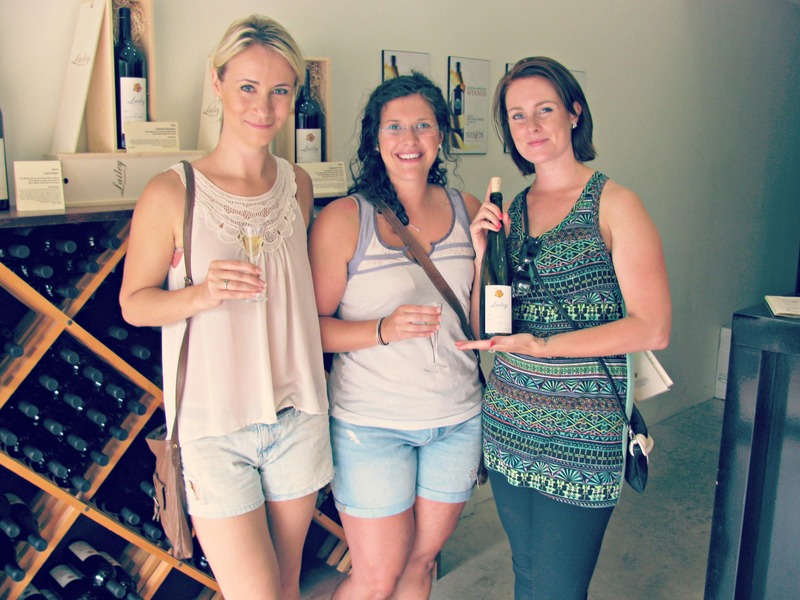 Last weekend I escaped the city on a long-awaited, much-anticipated and desperately needed girls weekend in wine country. Two of my best girlfriends from my hometown flew down to Toronto and we set off for two nights in Niagara-on-the-Lake while our guys had bachelor weekends (read: stayed home and played video games). 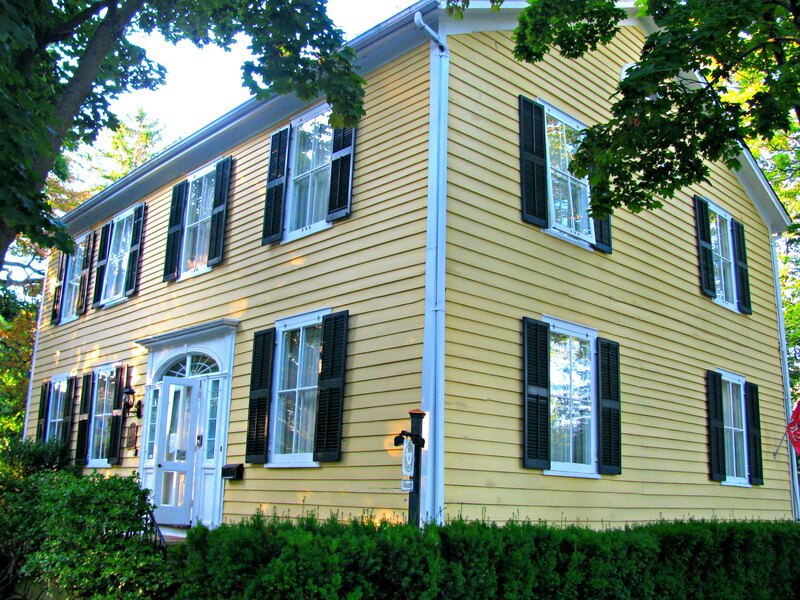 We stayed at the Burke House Inn, a sunny yellow bed & breakfast built in 1826. 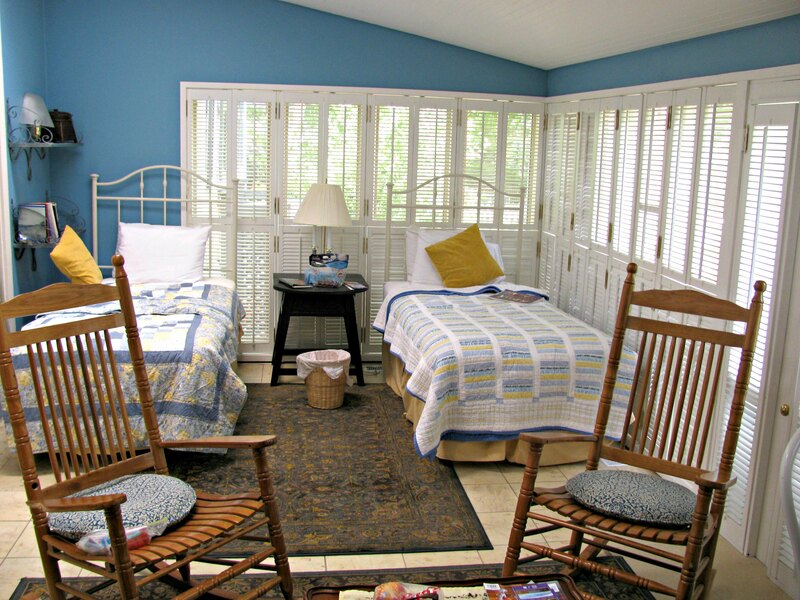 I would absolutely recommend it for a girls getaway – most B&B’s are set up for couples and we initially had a hard time finding a good deal for three people. We stayed in the ‘Mr. Hughes’ suite which had two rooms with one queen and two twin beds. We were just off of the main street and had our own private entrance and patio – so the midnight stroll back from the Irish pub was short and didn’t disturb our fellow guests. Pondview Estate’s Harmony White – An easy-drinking blend of Chardonnay, Gewurztraminer and Riesling. There’s a bottle in my fridge right now but not for long! Frogpond Farm’s Organic Grape Juice – Made with organic Vidal grapes, a very grown-up grape juice that hits the tongue like honey but doesn’t have a lingering sweetness. Lailey Vinyard’s 2012 Vidal Select Late Harvest – Picked after the 15 of November but not while frozen, so it’s sweet but not as cloying as an ice wine. Apart from the wine tours, we enjoyed juicy roadside Niagara peaches, a beautiful bike ride up the Niagara parkway, a creepy ghost tour and way more ice cream than we needed. We had a few great meals (and one not-so-great meal), but by far the most delicious was the custom cheese plate we had made at Cheese Secrets. On the recommendation of our innkeeper, and after a long morning of bicycling and wine tasting (so arduous! ), we visited these extraordinary cheesemongers. We told them what we liked and how much we wanted to spend, and they set to work creating a custom plate with generous slices of Niagara Gold, Sauvagine and Bleu Ermite cheeses along with charcuterie, dried fruit and nuts. To complete the meal we grabbed a freshly baked baguette (still hot! ), a box of crackers and a bottle of Inniskillin’s Niagara Estate Series Late Harvest Riesling. The only downside was that we had to be extra careful walking back to the inn – strangers on the street kept trying to steal the tray and inviting themselves back to our place! 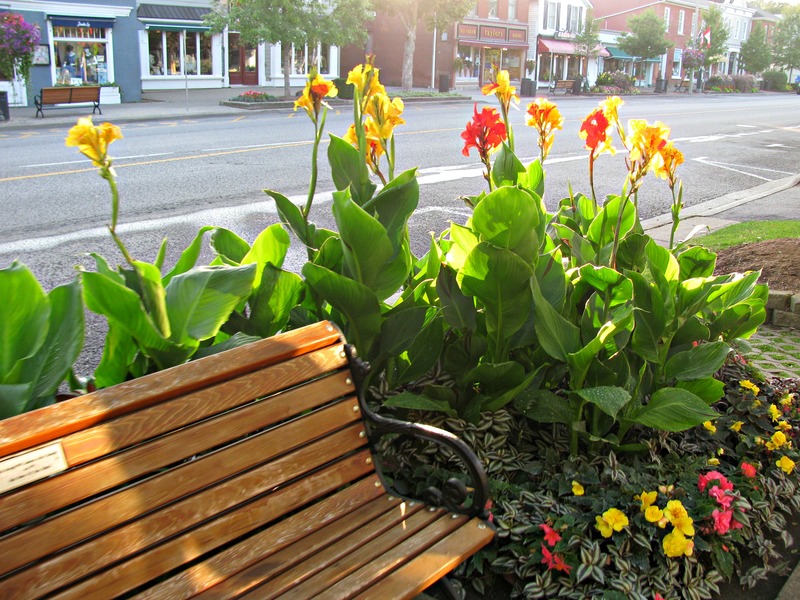 For such a small town, Niagara-on-the-Lake punches above it’s weight in a lot of areas – wine, fruit, houses, history, and not least of all, frozen desserts. You could get a cone at every second door on the main street, including an outpost of PEI’s Cow’s Creamery, but the best was Il Gelato Di Carlotta – Lateria. I’m still dreaming about their pistachio gelato, which is from Milan and made with nuts from Sicily. We didn’t try any of their gorgeous handcrafted biscotti ice cream sandwiches but they’re on my list for my next visit. We left in the Sunday morning sunshine with slight headaches from doing ‘Sociables’ (raising glasses of Glenmorangie and Guiness to Irish music) the night prior. 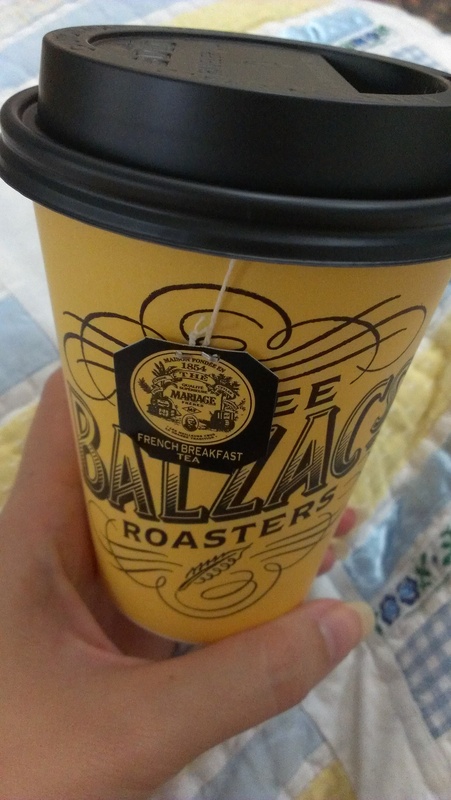 Luckily we were equipped with caffeine from Balzac’s for the ride home. I tried their Parisian Mist, a blend of French Breakfast tea with steamed milk and vanilla – sort of an elevated London Fog. That’s it! Next week’s post will have more frocks, promise. For the Frock & Fig’s inaugural post, I’m going literal with a proper tea dress and a black mission fig and peach crostata. Don’t worry though, this blog won’t be all flounces and Ficus carica – I’ve been known to don a pair of trousers and cook a steak too. I celebrated a friend’s birthday last weekend with dinner at Grano up near Davisville. It was a gorgeous evening and we had the private dining courtyard in the back to ourselves, where we ate alfresco in the warm summer air. I’d planned to wear a new bright blue form fitting Zara dress but the weather was so warm I changed my mind at the last minute and went with this breezy little number. This sundress is so comfortable and versatile – I’ve worn it to a wedding and even to work smartened up with a cardigan and belt. The only real accessory it needs is a tan though, so I kept it simple here with fine gold jewelry and flat sandals. My boss and I had a lunch meeting at Balzac’s this week and we walked back to the office through the St. Lawrence Market. She bought some black mission figs and sent me home with a half dozen. I’ve been dreaming about Forno Cultura’s beautiful crostatas which are baked in a long fluted rectangular pan, so you can slice off a tidy little tranche at a time. 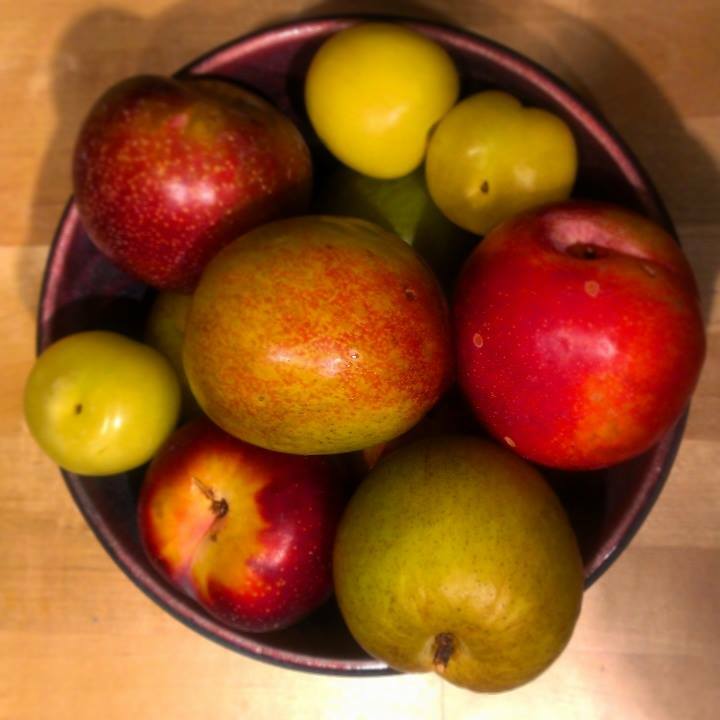 I’d recently picked up such a pan from Williams Sonoma and decided to try it out using the figs as well as some Ontario peaches and pluots which are at the height of their season. I started out by mixing the pie crust and chilling the dough – you can use any recipe, I like Crisco‘s as it’s straightforward (and on the box!). I put my mixing bowl, wire whip mixing attachment and granite rolling pin in the freezer before starting – this will help make your pastry flaky. 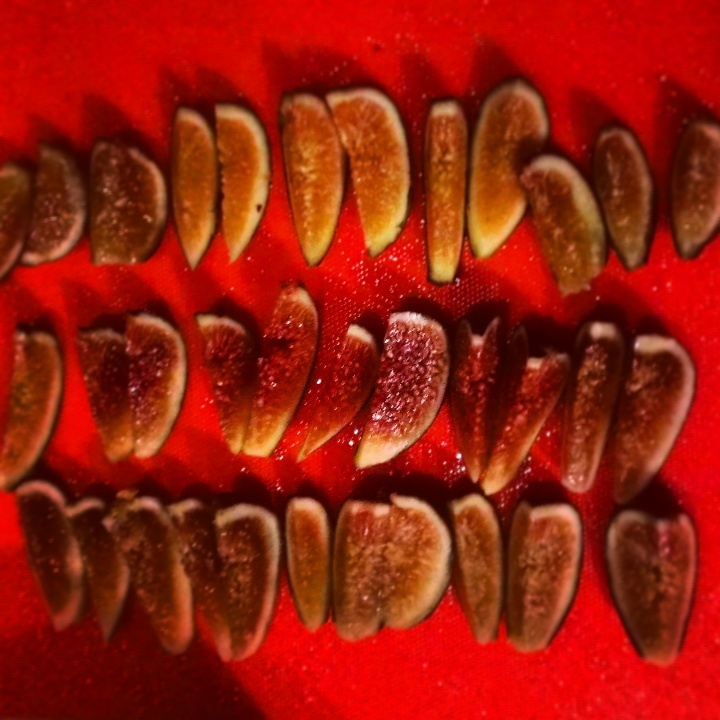 Then I went to work thinly slicing the peaches and figs. Next I mixed up a half cup of sugar, one tbsp cornstarch, one tsp cardamom, one tsp lemon juice, and the zest of half a lemon. 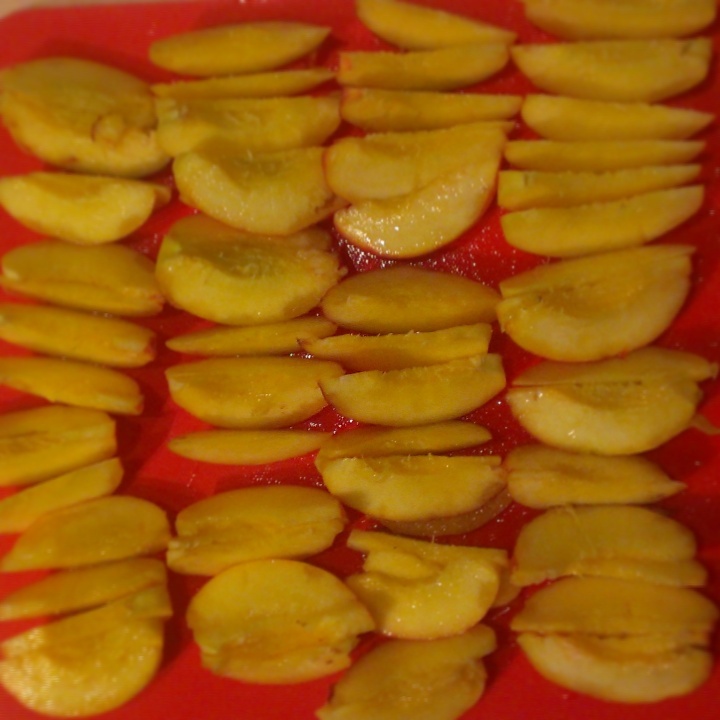 I added this to the peaches (not the figs – they’re too fragile) and let them macerate about 15 mins while I prepared the crust. 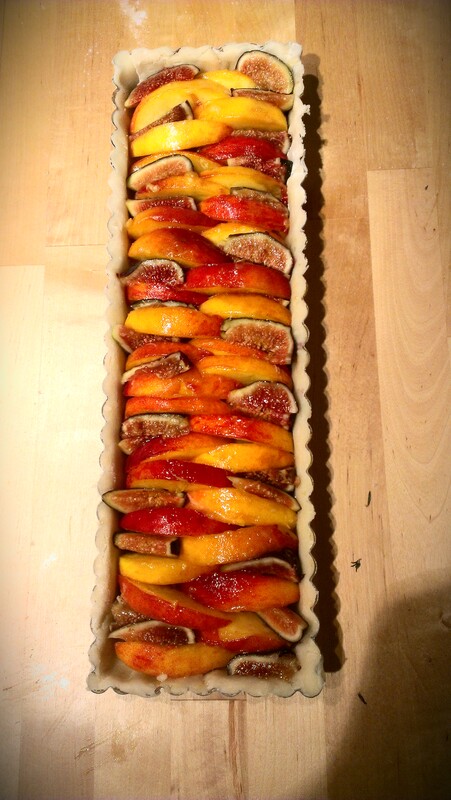 I rolled out the dough, slipped it into the pan and layered in the peaches and figs. 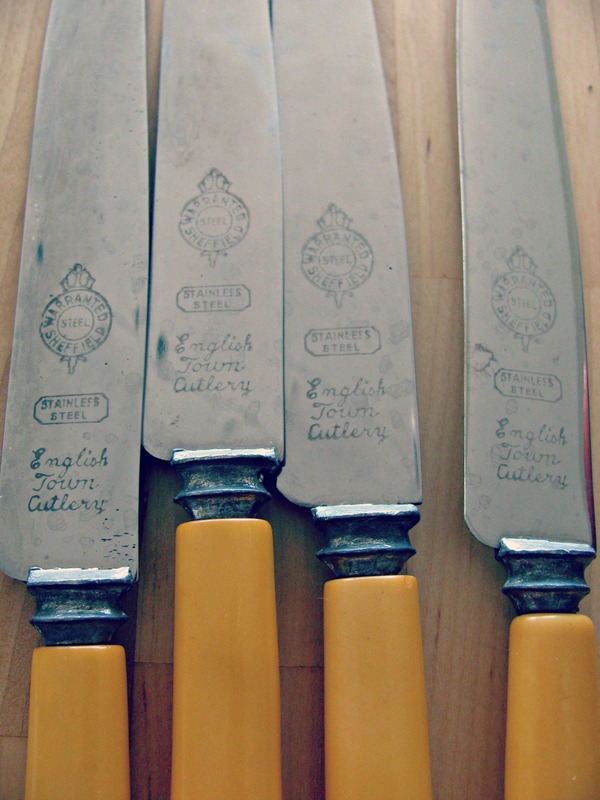 I made a fancy top crust using pie crust cutters from Williams Sonoma – see similar ones here – and glazed it with egg yolk and sugar. 40 minutes in the oven at 400 degrees F and I had a beautiful golden crostata. 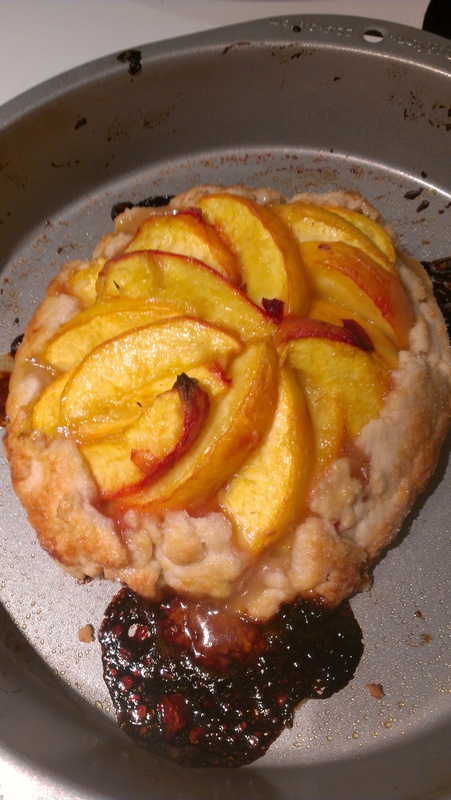 I had some extra dough and peaches so I threw together a rustic version as well. 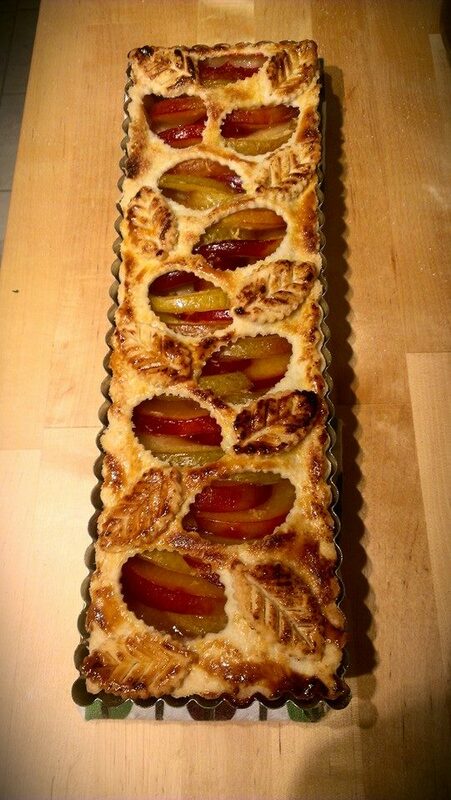 I also made one with pluots, omitting the cardamom but adding some fresh thyme.